The Williams is off the beaten track for a City pub, giving it a very different atmosphere and clientele list then other City pubs. 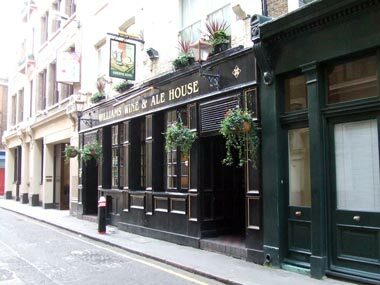 Although the name might suggest a posh wine bar, you will find the Williams to be a traditional pub. The ale is very well presented and they have Cask Marque accreditation. This puts them in an elite list of pubs within the City of London where you are pretty much guaranteed a good pint of beer. The post code is also part of an elite list for City pub, those without EC yet still fall within the Square Mile and to top it all, the City Boundary runs right outside the front door. A Williams's has stood on this site since 1682, although it was known as The Ship in the 1970's. This has always been an excellent pub, there is an excellent mix of workers and the atmosphere remains friendly. With the excellent choice of beers, this is definitely a pub to spend a evening talking and drinking pints.